Camden like other councils is being told by the government to vote on something called the North London SUSTAINABILITY & TRANSFORMATION PLAN (STP). We think they should reject it. STPs are the latest way the Tory government is forcing local health authorities to make cuts. These secret plans have been used bully and bribe councils into backing massive NHS cuts. The five boroughs in North Central London, a ‘footprint’ area which includes Camden are expected to find between £121 and £867 million in cuts to balance the books. Hospitals already only just coping are threatened with further cuts without extra provision in community services. 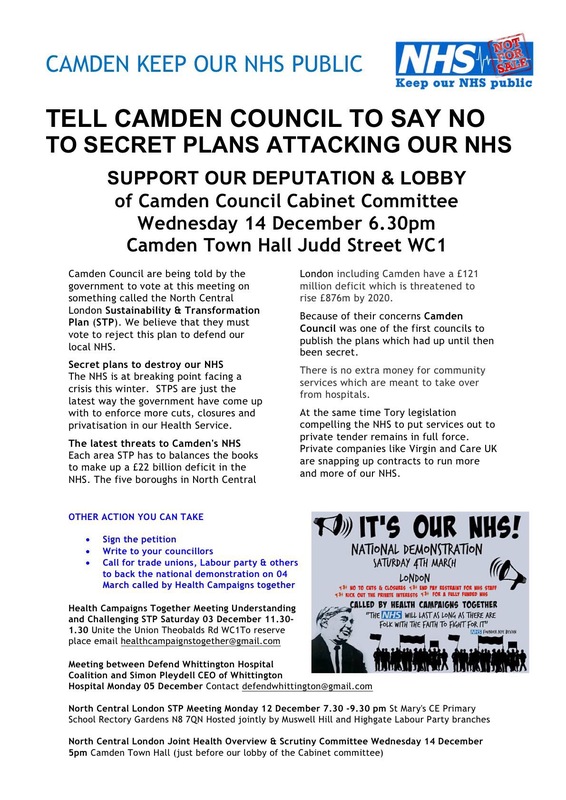 This entry was posted on December 9, 2016 by CAMDEN TRADES COUNCIL.